We build carefully designed native mobile applications on iOS and Android platforms. In addition, where the nature of the user interface allows, we create HTML5 based mobile applications for all major mobile platforms. User interface design and usability are our passion. We don't want to create anything that we wouldn't want to use ourselves. Please do not hesitate to contact us for a further discussion. 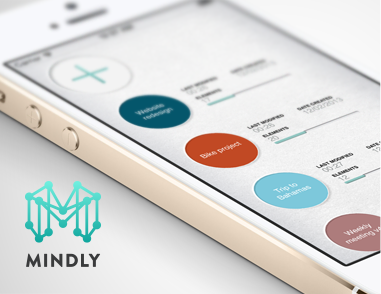 Mindly helps to structure your thougths, capture ideas, plan a speech or take notes. Mindly is available for iPhone/iPad, Android and Mac OS X. See mindlyapp.com for more information. Have you ever participated in a software project which did not deliver a great user experience? We do not want to do that ever again. No more compromises. You make a compromise, when someone comes with a design idea and you feel relieved. Problem solved. To get the work done you quickly jump into implementing it. You have not really thought it through, questioned it, tried to find where it fails. You make a compromise, when you get proposed something that has a nice visual appearance and you let that deceive you. It looks good so it must be good. You make a compromise, when you do not take responsibility of what you are building. When someone in the project team takes a decision and you just accept it because it falls under "his domain". The responsibility is his, you secretly think, I am just a programmer. You make a compromise, if you do not feel responsible towards your users. If you accept something that is "good enough". Because there is no end for making that compromise. The problem is that you will repeat and repeat this compromise until the whole product truly is not good enough.